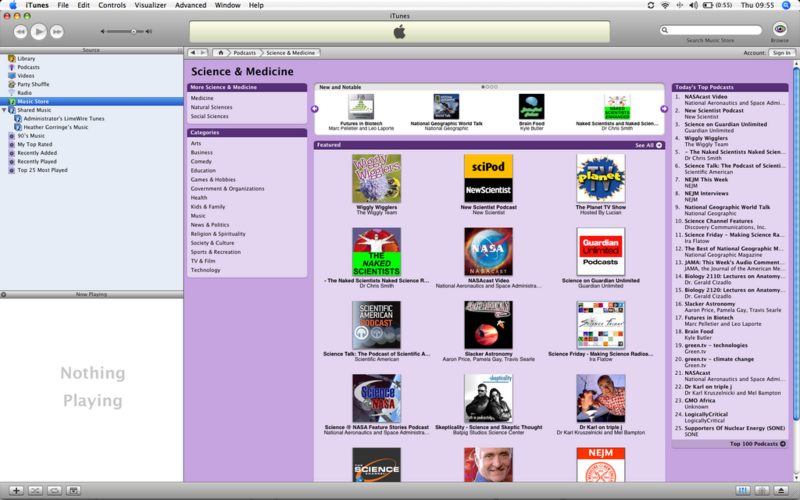 How exciting, the Wiggly Podcast has made the homepage of podcasts on the UK iTunes,......and we are all pleased as Milka. We now have eight wonderful reviews. Yippee! Listen in! Next week's podcast is a search for Glow Worms and Slow Worms and much much more. 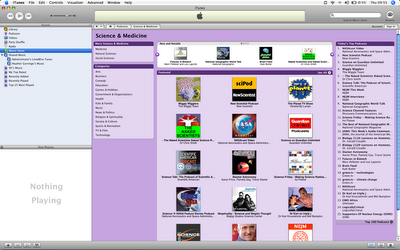 This weeks podcast is number 41, amazing to think that we have completed all these episodes. Last week we had over 2100 listeners on the TB podcast and this week we escape and record the show from outside in the Wiggly Garden. Escape to the Wiggly Garden with the Team. It's the first day of the first ever podcast harvest but it's so hot that the grass has stopped growing. 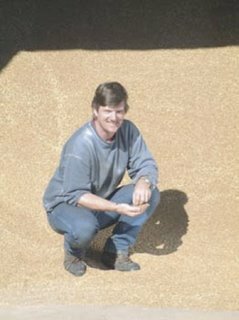 Still Farmer Phil has an air-conditioned combine, not that that impresses Richard. There's a tale of three ponds, but which pond does Heather fall into? Alison tells the story of harvesting wild flower seeds with a mini-combine straight from the drawing board of Heath Robinson. Finally Monty, Richard and Heather go pond dipping - another podcast first. This week's podcast is packed with TB info, whether it be the human form, the bovine form or what we can do to help stop it spreading in cattle and badgers. Farmer Phil's Skype interview with Melanie Mathews from the TB Alert charity was more extensive than anyone expected and too interesting to edit... So here have a listen in full as another summer special! Not HiFi! The piccy above is Farmer Phil in the grain store. This one is currently full with Bokashi - and Bokashi could possibly help to keep Badgers and Cattle healthy and therefore TB free! Our podcast has started inspiring young and old, most popular features seem to be the Monty weekly Wormcast on worms and the Farmer Phil report. 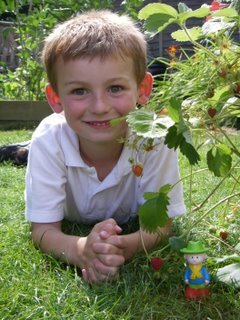 So much so that I've just received this wonderful photo of Harry who has grown his own strawberries. Keep casting your worms and your pods (we love Monty’s wormcast feature- he’s much more informative than Monty Don was. Even I could think of something more interesting on the spare of the moment than he did!) 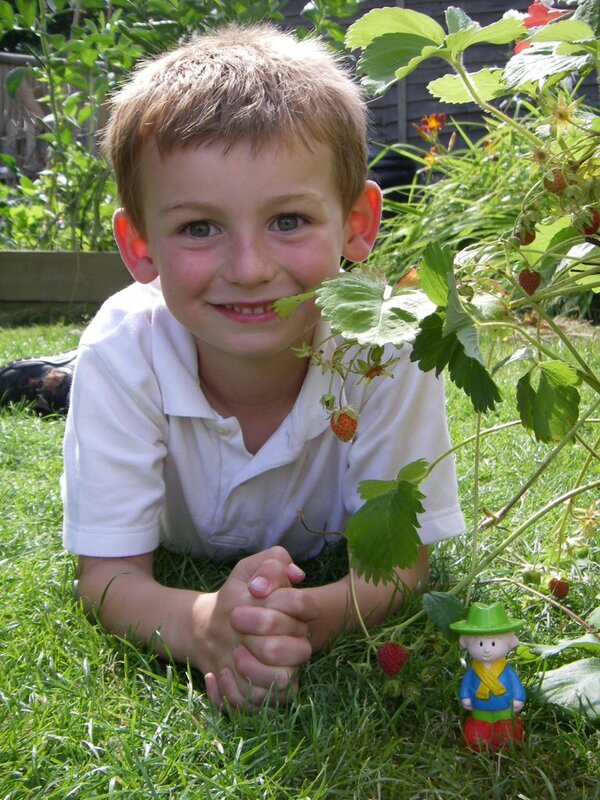 We are starting a Greenfingers club for the infants in Harry’s school next term and you have inspired us to have a go at podcasting too (eventually!) We’ll certainly have to have a can o’worms!